Family holiday photos are so cute. They’re perfect for Christmas cards and make great keepsakes. Unfortunately having them professionally done can be quite expensive. If you can’t afford a professional photographer you can still take some great photos at home. Use these tips and tricks to get your own sweet photos of your kids and family. This post contains affiliate links. If you make a purchase after clicking one of my links I may earn a commission at no additional cost to you. Use the best cell phone you can get access to! I try to take photos with my husband’s phone whenever possible as he has the iPhone 10 and it takes much better photos than my iPhone 6, which is what I used to shoot my Christmas photos last year. Borrow and use the newest one you can get access to in order to get the best quality photos. You can get amazing photos with a phone camera these days! A cute outfit can make or break your Christmas photos. That doesn’t mean you have to spend $100 at some boutique store! Walmart and Target often have really cute items that won’t cost you too much. Check out all these cute matching family pajamas! If you’re going to put a lot of props in the background keep your outfit more simple. If you are keeping the background simple you can choose a busier pattern for the clothing. For a family photo, I recommend starting with moms outfit. Let’s face it, us moms are usually the most critical of the way we look in things. Try a local thrift shop or Buy Nothing Group on Facebook to find a dress to have or to borrow! Often other ladies have one from last year that they only wore a handful of times and will be willing to pass along! Once you have moms outfit locked down work on the kid’s outfits and then save Dad’s for last. Men are generally the easiest to dress and least picky. Don’t be afraid to add a few lights! This set-up was made with just a few Christmas decor items and some lights against a white background. You can pick up the decor for cheap at CVS, the dollar store, or the Target dollar spot. If you don’t have a white bedspread try to borrow one, ask in a local Buy Nothing facebook group, or use a white sheet over the top. It can be hard to get kids to cooperate for photos. I’m not above using bribery to get them to participate, especially if you’re doing a few different set-ups. By the time we got to this setup with these cute Grinch Pajamas, my daughter was getting tired of working with us. Our solution was to bribe her with a cookie, it made for a cute photo too! This set up was so simple! 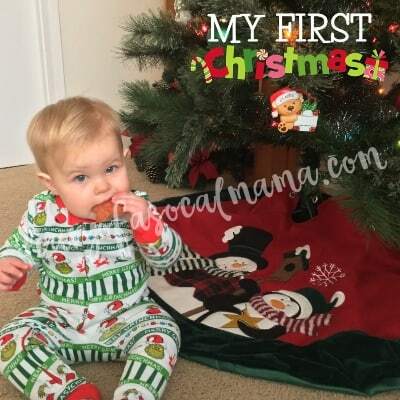 all we needed were these cute Grinch Pajamas, our own Christmas tree, and a cookie! For our family photo we called in the grandparents for help, not only to supply the beautiful fireplace backdrop but to work as our photographer as well! 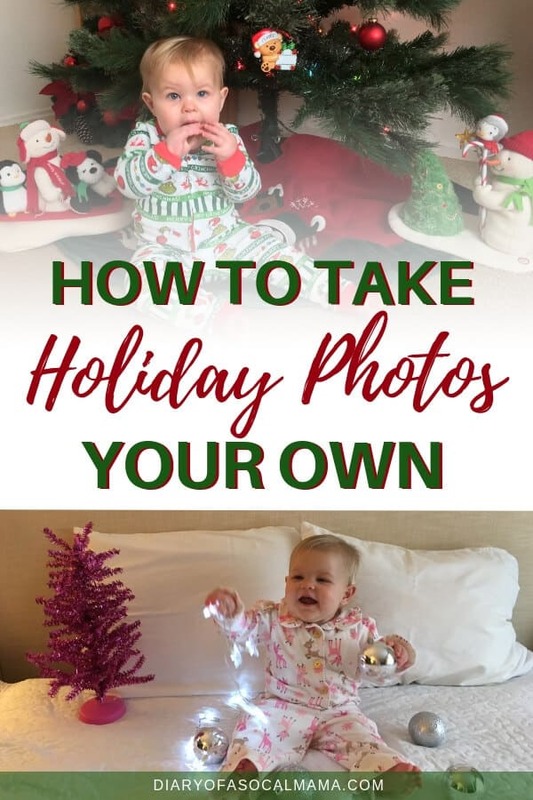 Even for set-ups where it’s only your kids having an extra photographer can help. They may get a different angle or the perfect moment in time that results in the perfect photo. As amateur mom photographers the more photos you get the more likely you are to get a few great shots! 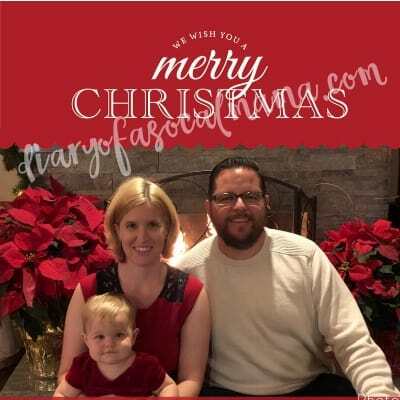 If you can’t get help borrow or buy a phone stand so you can remotely take family photos! Now that you have your photos it’s time to edit and print them. My personal favorite for editing photos is an app called Photo Director on my iPhone. Next, decide if you want to print the photos as inserts for another card or order them as actual cards. 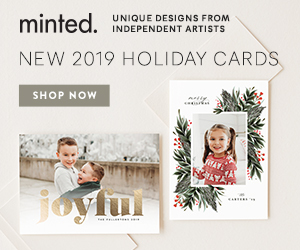 If you want something a bit fancier check out Minted Holiday Cards! They have tons of beautiful cards to choose from that you can customize with your very own photos!